American Alpine Institute - Climbing Blog: Weekend fun at the Rope Up! Kurt enjoys moderate fall slab climbing. On the approach to Domestic Dome. Natasha says, "I can always appreciate the beautiful landscape of Icicle and Tumwater Canyons, but Leavenworth in the fall has an exquisite aesthetic." In Kurt's words, "It was sick!" The two spent their time playing at Domestic Dome, which offers some moderate slab climbing. They also paid a visit to Castle Rock to climb Midway, a fun route that requires climbers to step off of a detached tower onto the main face. "Very fun!" Natasha says. "It was a perfect fall weekend. If you have not climbed here in the fall, come out to enjoy the colors, brisk air, and fun climbing!" Natasha climbs Midway on Castle Rock. 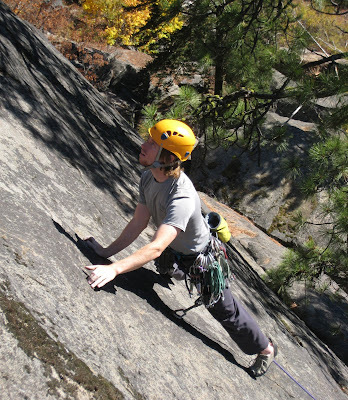 To sign up for a day or two of fall rock climbing in Leavenworth, Index, Squamish, or at Mt. Erie, give us a call! 800-424-2249 or 360-671-1505. You can also email us at info@aai.cc. Visit our Pacific Northwest Rock Climbing web page as well for more info. Kurt and Dave climb the last pitch of Midway. Castle Tower peaking though fall leaves. Fall in the Leavenworth area is a beautiful sight to behold.